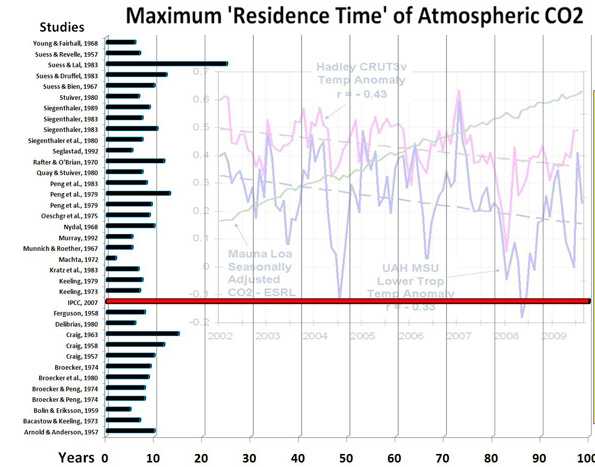 THE HOCKEY SCHTICK: CO2 Lifetime: Which do you believe- Models or Data? CO2 Lifetime: Which do you believe- Models or Data? The IPCC loves theoretical computer models, even when said models have not been experimentally verified or actually contradict experimental data. However, as Richard Feynman, PhD, Nobel Laureate in Physics, famously said "It doesn't matter how beautiful your theory is, it doesn't matter how smart you are. If your theory doesn't agree with experiment, it's wrong". As shown in a prior post, the IPCC AR4 states that the models at the heart of the confidence level of at least 90% that man is responsible for global warming have not been tested against observational data and furthermore the necessary tests to evaluate the models have yet to be developed. In addition, observational satellite data has since shown uniformly that the models fail miserably. Let that not be an impedance to the settled consensus, however. If man-made CO2 emissions only resided in the atmosphere ~5 years rather than the hundreds to infinite years asserted by the IPCC, then there would not be any urgency to drastically reduce CO2 emissions even if the IPCC climate models were correct. I recently had an in-person & email exchange on this topic with a senior atmospheric scientist studying the effects of CO2 for a federal agency, in which he stated that the CO2 residence time in the atmosphere is in the hundreds to thousands of years, in agreement with the IPCC. He admitted that the theoretical models do not close the "carbon budget", in other words there is a large "missing sink" unaccounted for by the models (a recent paper explains that the "missing sink" may really just be due to the models overestimating CO2 lifetime). When I mentioned that the observational data shows residence time to average only about 5 years he was surprised and said he knew of no papers to support such a notion. I sent him a link to an excellent Guest Editorial at co2science.org by Tom V. Segalstad, PhD, Associate Professor of Resource and Environmental Geology, The University of Oslo, Norway, who is a world expert on this matter. The lifetime of atmospheric CO2 has been measured in many ways: carbon-14, radon-222, the carbon-13/carbon-12 ratio, solubility, and kinetics. All these methods find a lifetime of CO2 of about 5 years (plus/minus some few years); far from many thousands of years. IPCC and their coworkers assume that the recent rise in CO2 is due to anthropogenic CO2 (but this is not proven by carbon isotopes, which show that only 4-5 % of this rise in anthropogenic). Hence, they assert, anthropogenic CO2 must have a lifetime of several thousand years, if this CO2 is just accumulating in the atmosphere. But the anthropogenic CO2 molecules cannot accumulate in the atmosphere, because of Henry's Law, which says that most of the atmospheric CO2 must be exchanged with the ocean water. In further discussions, you may ask what isotopic measurements support the view that atmospheric CO2 has a lifetime of thousands of years? In their description of the Bern Model, you see that they state their global carbon model is based on that everything is in balance, until anthropogenic CO2 enters the system as an additional pulse. This additional pulse is then, according to the Bern Model, not immediately taken up in their "equilibrium earth model", resulting in an anthropogenic rise in atmospheric CO2. You see the Bern Model coming into play in the Technical Summary of the IPCC FAR (Fourth Assessment Report) Table TS2, page 33-34, footnote a; used in their Chapter 10. In their FAR report IPCC has replaced their "rough indication" atmospheric CO2 lifetime of 50 - 200 years from their IPCC 1st report, with the theoretical Bern Model exponential decay equation, which never will reach zero. The anthropogenic CO2 fraction will always be there, according to the Bern model. Carbon isotope analysis of atmospheric CO2 proves that the theoretical Bern model is far from reality. Furthermore, breweries test this experimentally numerous times every day. They artificially add CO2 to the air on top of water in bottles, to produce soda, "mineral water". It would be bad business for them if it was not possible to add this CO2 to the water. Either the 1st IPCC CO2 lifetime approach would take the breweries 50 - 200 years to produce their soda; or with the Bern Model, it would take forever. Pick your choice. It looks like the brewery industry is proving IPCC wrong every day? But let that not be an impedance to the IPCC, to use a flawed theoretical model of CO2 levels that greatly exceeds observations as the primary input to the flawed theoretical model of climate change which also does not agree with observations. It requires cojones grande to then claim they have over 90% confidence in that result. Where has all the carbon gone? Got here following the link you posted at WUWT. Nice work. Nice site. I'll be back to read more of your postings.